So Friday was the Dead Baby Downhill ride. I wasn't sure what to expect from it. Most of the guys I ride with described it as amazing. That still didn't explain what it was. Frankly I was expecting a sort of race an maybe a hundred participants. I wasn't even sure I was going to go. Finally I decided I just needed to stop being lazy and do it. When I got to the top of Admiral Way I was amazed. It wasn't a couple of guys on bikes. It was thousands of people on bikes. There were more shapes and colors of two wheeled craft that I think I have ever seen in one place. Lots of fixed gears and older tuned up road bikes. A few tall bikes and freak bikes. There was even a guy riding a tiny pink bike it looked like he stole from his 3 year old sister. The one thing missing was guys in spandex. The race started with a Bang! and the mass of bikes smushed forward and down the hill. I don't know how long it took the group to fully pass by, but it must have been a while. Cars must have been stuck at the various intersections for 20 minutes before they could even hope for a space to get by. 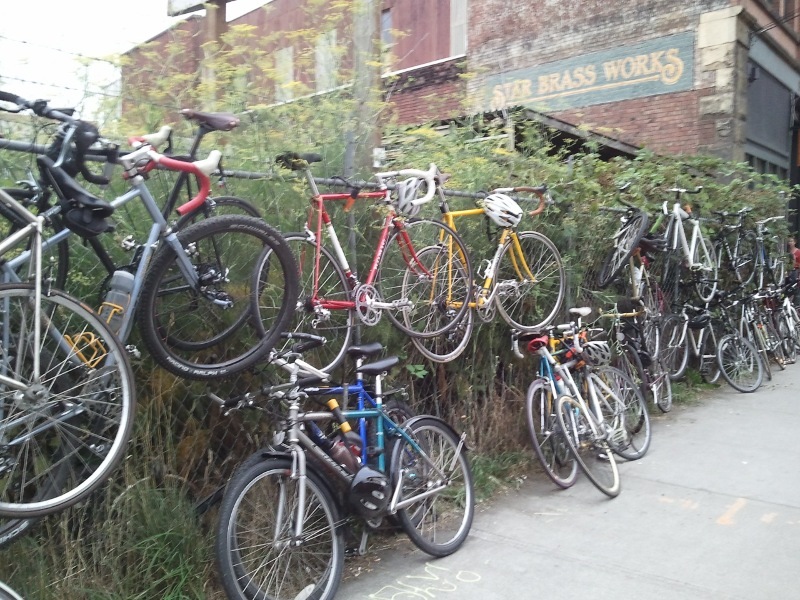 The mass of bikes raced along over the Duwamish and into Georgetown through the train yards. That wasn't exactly an easy place to bike. I saw at least a half dozen people with flats from running over the tracks. I even dropped my chain along the way. Once in Georgetown, I was in for a bigger treat. Three blocks of the city had been taken over. The bikes were locked to everything in sight. There were at least three stages set up for live music. A couple of beer gardens. Trucks selling all kinds of foods. Even a few pedal powered carnival rides. And milling around through it all was this massive cadre of cyclists. It had me thinking about the number of people who were actually bike regularly in Seattle. There were probably two thousand people on bikes for this event. I am guessing that doesn't include many of the casual commuters or the lycra clad road warriors. The amount of pedal power generated in the city on a daily basis must really be massive. I did leave before the bike jousting began. Too bad, I really wanted to see that. I did have a good time though and hope to see more people out next year.